One of the important goals of exoplanet science is to discover habitable planets that have the necessary conditions for life to form and thrive. Such planets will exist within the ‘habitable zone’ of a star, defined to be the range of planetary orbits for which planets could have surface temperatures at which water is in liquid form, as liquid water is currently believed to be crucial for life to develop. Astronomers haven’t quite settled on a solid definition of where the habitable zone is for a variety of reasons. Some scientists have used the planet’s equilibrium temperature as a way of calculating habitability, largely because it’s simple to calculate using the planet’s orbital parameters and a guess for the planet’s albedo. However, in reality planets will have atmospheres that actually cause the surface temperature to be higher than the equilibrium temperature because of a process known as the Greenhouse Effect. Gliese 581d, the subject of this paper, had previously been modeled using 1-dimensional models that suggested that a strong greenhouse effect from a dense carbon dioxide-rich atmosphere could place Gliese 581d within the habitable zone. However, it was unclear whether this type of atmosphere could exist because the planet is likely in spin-orbit resonance with the host star (meaning that the planet rotates exactly an integer number of times for each orbit). This resonance means that there are cold spots on the poles and on the night side of the planet; models show that these regions act as traps where volatiles freeze out of the atmosphere onto the surface, quickly depleting the atmosphere of the carbon dioxide necessary to keep the planet warm. 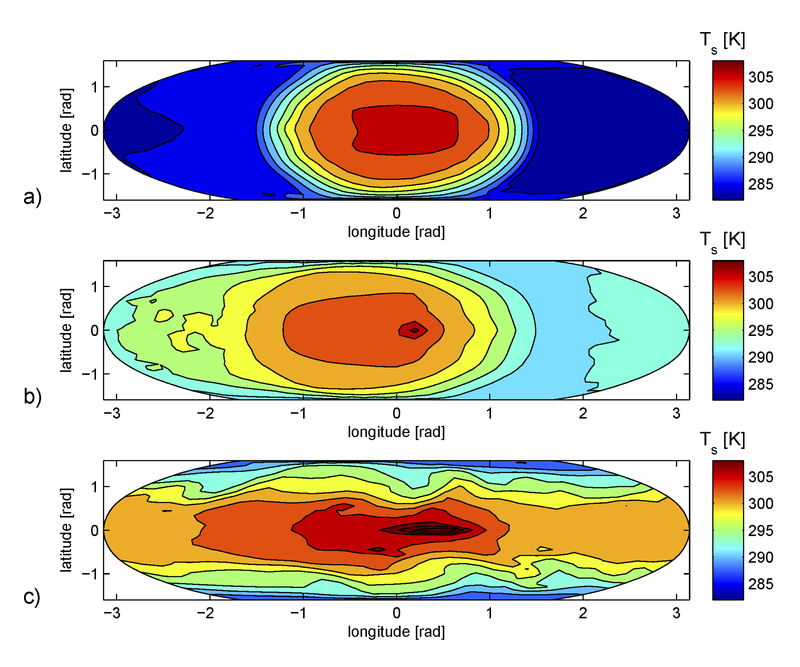 In this paper, the authors use a global circulation model (GCM) to determine the surface temperature of Gliese 581d at each location on the surface (the same types of models are used to model the evolution of the Earth’s climate). In contrast to the 1-dimensional models that had been done before, this GCM allows them to model the effects of circulation of heat around the planet, include effects of precipitation and clouds, and adjust the atmospheric abundances if carbon dioxide or water begins to freeze onto the polar regions. Two types of planets are modeled: one type made of rock and one type with a liquid water ocean on the surface. The atmospheres were assumed to be made mostly of carbon dioxide and the water fraction in the atmosphere was allowed to vary as clouds, ice, or liquid water form. They perform simulations of atmospheres with four different thicknesses (between 5 and 30 bars of pressure) and 3 different orbital configurations (1:1, 1:2, and 1:10 orbit-rotation resonances). These simulations generate the surface temperature as a function of position on the planet and allow the researchers to determine whether the atmosphere will be stable or if the greenhouse gases will freeze-out. Planets with carbon dioxide atmospheres of under ~10 bars were unstable: the carbon dioxide condensed on the dark side or poles of the planet and the planet became too cold for liquid water to exist. 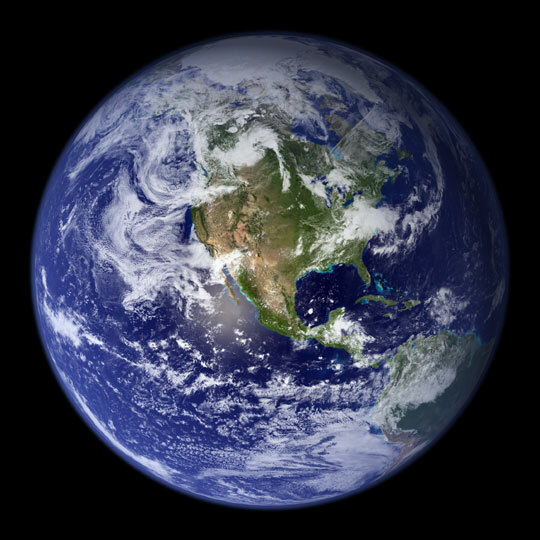 However, for atmospheres that were at pressures above 10 bars, the global warming effect of carbon dioxide and the efficiency of heat transport around the planet made the atmospheres stable and warm enough for liquid water. The authors speculate that Gliese 581 should have enough carbon dioxide overall to maintain an atmosphere with a carbon dioxide partial pressure of ~10 bars to keep Gliese 581d warm and stable, but note that there are many other possibilities for atmospheric composition. Furthermore, they remind us that Gliese 581 is only 20 lightyears from Earth and, while beyond the capabilities of current telescopes, will be a good candidate for direct spectroscopic observations for future instruments.